Manufacturing has long been a cornerstone of this country. 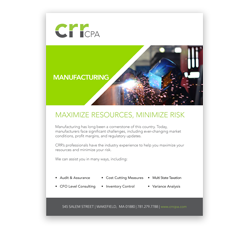 Today, manufacturers face significant challenges, including ever changing market conditions, profit margins, and regulatory updates. CRR's professionals have the industry experience to help you maximize your resources and minimize your risk.